Go, Gazetteer, Go . . . .
Our pal RossK got some well-deserved recognition today. We're paying new attention to the local blogosphere, and we hope you will too. You'll find new categories, more sites, easier navigation. And we’ve added... Blog of the Week: Every week we'll recommend a B.C. blog that we think deserves more attention. Such sites are informative, well designed, and well written, with a distinctive attitude. The Gazetteer is combative, easy to read and navigate, and strongly engaged in B.C. politics. The daily coverage of the election has plenty of items that most media don't run. We appreciate your efforts to inform the blogosphere. Thank You, Sir . . . .
Blooming Intermission . . . . Tired of news regarding the failing economy, swine flu, torture and war? Time for a break to slow down and enjoy the spring blooms in your 'hood. Bet'cha feel better now . . . .
'Bout Time . . . . The House Judiciary Committee approved legislation Thursday to extend federal hate crimes law to cover offenses based on sexual orientation. The measure was approved 15-12 after a two-day debate and the defeat of more than a dozen Republican amendments. Current federal hate crime law covers the use or threat of force based on race, color, religion or national origin. The new bill also covers crimes committed based on gender identity. The panel considered more than a dozen GOP amendments Wednesday over the course of five hours, and rejected another five before approving the bill. Committee Republicans objected to the bill on First Amendment grounds and because they believe it amounts to favoritism toward certain groups. “Every human being in the world deserves to be equally protected, no matter who they are or who they go to bed with,” shouted Republican Louie Gohmert of Texas, the ranking member on the Crime and Terrorism Subcommittee, in an impassioned speech opposing the measure. It's a start for our friends South of the 49th, but will it be passed by Congress and enforced as the "law of the land"? Vancouver Sun Run 2009 . . . . It was "drf" and the "Four-Footed Child's" first time to see the Vancouver Sun Run today. Last year's event was my first, and the whole family got to see it together this year. 55,000+ participants in the 10K come within two blocks of our home - a must-see Vancouver event. Take a wild guess as to who had the most fun . . . .
Waking Up Canadian . . . .
We love Rachel Maddow . . . . I say we give Rachel citizenship along with her brother . . . .
rick warren "Sick With Exhaustion" . . . . Does the good pastor really expect us to believe that one? 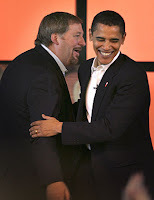 Rick Warren Cancels ABC Appearance "Moments Before," Claims "Exhaustion"
Pastor Rick Warren who last week denied ever supporting California's anti-gay marriage Proposition 8 despite evidence to the contrary, has now bailed on an opportunity to explain himself. Warren canceled an Easter Sunday appearance on ABC's "This Week" just "moments before the scheduled interview," host George Stephanopoulos told viewers. Even 2008's winner of the Nobel Prize for Economics Paul Krugman weighs in on this one. The next time the rev. is preachin' the ten commandments, he may want to pay particular attention to the ninth one . . . . 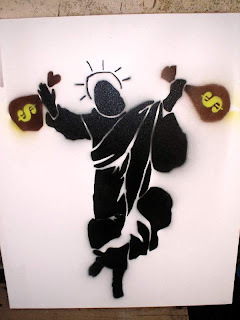 Religion Rides to the Rescue of Wall Street . . . . It's about a week late for April Fool's, so maybe this is actually legit. It ought to have a dramatic effect on the current financial situation, so pay attention. The market for socially responsible investing continues to grow for exchange-traded funds investors. Now, a group based in Oklahoma City, Okla., is proposing a set of faith-specific ETFs to launch in the near future. The FaithShares will be screened for social values of each faith through KLD indexes. FTSE Group, the well-known international index provider, will calculate the indexes. Various broad FTSE indexes will also be used as benchmarks against the KLD indexes. pat robertson, pope bennie, ted haggard, charles stanley, et al. That oughta handle it, eh ? ? ? ?